I was given a wonderful opportunity to work with Pop Art Toaster on a review. Linda Carlish is the founder of Pop Art Toaster. Their first product was the Pop Art Toaster that used plates to that made images on bread when it was toasted. Then they came up with the Creativity Coloring Kit that came with edible flavored markers so that kids can color their images on their toast! 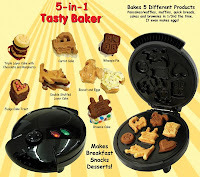 The next product they came up with was the 5 in 1 Tasty Baker that you can make mini cakes, muffins, and more with fun shapes. They later came out with the 5 in 1 Tasty Baker featuring Disney characters! 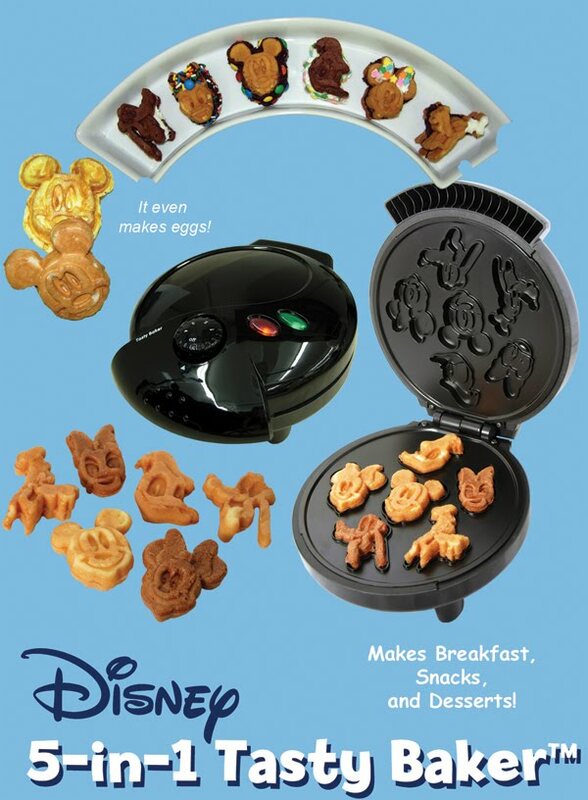 You can buy a Mickey or a Princess Tasty Baker! Our family was sent a Disney Princess 5 in 1 Tasty Baker for our use and review. The Disney Princess 5 in 1 Tasty Baker makes 5 different shapes in the shapes of a tiara, a princess silhouette, a dress, a rose, and a castle. The inside of the 5 in 1 Tasty Baker are metal plates with the molds on them top and bottom. With the Tasty Baker was a measuring cup to make pouring your batter into the molds easier. There is also a cleaning brush because you are not supposed to submerge it in the water. There were also some really fun recipes to give you ideas on what to make! Our daughter had a lot of fun mixing batter and every time we used the 5 in 1 Tasty Baker, she got to help. Working in the kitchen and being involved and helping is therapeutic to her. With her disabilities, it helps a lot in that way. Mixing the batter even helps her improve on her motor skills which she lacks in. We also let her try to fill the molds but she had a little difficulty at first but after practice with using it, she could do it a lot better. Filling the molds are really easy though. All you have to do is fill them to the top. You don’t want to overfill them though because whatever it is that you are making can bake around the edges. If they do, the edges can be torn off pretty easy because of how well the molds fit together. We have made muffins, mini pancakes, biscuits, eggs, and even brownies! We lightly sprayed the plates but no matter what we made in the 5 in 1 Tasty Baker, everything came out of the molds really easily. I was very pleased with it and surprised at how easy it was. You may want to use a fork or something to lift up one of the sides though because the plates are hot. There is a simple dial on the top of the 5 in 1 Tasty Baker and using the recipe cards, we turned the dial to what it should be for muffins or brownies, etc. It doesn’t take very long either before they are done no matter what you are making. It’s a great way to make fun and quick snacks too! We made eggs and biscuits and made sandwiches! The 5 in 1 Tasty Baker is also really easy to clean. That’s a really big deal to this mom! I like things that are easy. The Tasty Baker is also so easy to use that eventually, our daughter was making eggs by herself! I was right there in the kitchen though because the plates get really hot so I feel she still needs supervision. She only needed a little help here or there but for the most part, she did it. She was really proud of herself too because she made breakfast for everyone. It was a big deal to her because she feels like she can’t do anything a lot. The other great thing is that it gets both our older kids eating without fussing. Our 4 year old son doesn’t like eating anything that is too big because he can’t cut things himself and doesn’t want anyone to do it for him. The shapes are the perfect size for him. Our daughter on the other hand, has a problem with how many items are on her plate. She has always been that way and even at 9 years old, I sometimes wonder if this will ever change. She has a problem with normal size pancakes for example because if she doesn’t have more than two, it’s a huge deal. It’s “why is there only two?” and there have been quite a few times there have been meltdowns at the table. I know this is partly because of her disablities. With the 5 in 1 Tasty Baker, I don’t have to worry about it. She has more items even though it’s still the same amount as those two normal size pancakes but it makes her happy. 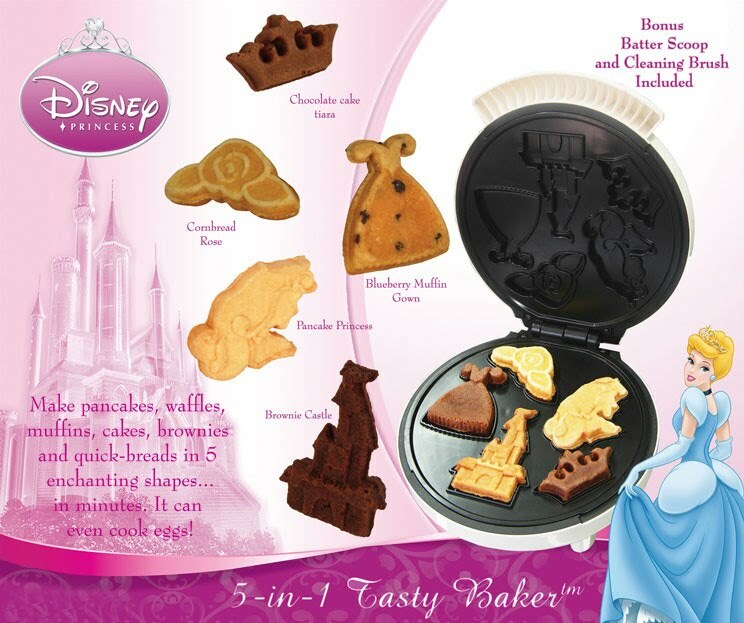 We absolutely love the Disney Princess 5 in 1 Tasty Baker! It’s a lot of fun and we use it all the time. Our kids love making their own snacks. When we made our brownies, we made ice cream sandwiches with them and the kids decorated theirs with sprinkles! Buy It: You can buy Pop Art Toaster products at Target and there are some other places you can buy them. Find out where by visiting Pop Art Toaster.